Jekyll & Hyde is a well known story which has been told by many authors, movie adaptations and screen plays. Now we have a chance to relive the tale again on the reels of this Microgaming slot. The designers of the game decided to go with a modern 243 ways to win design, an overall dark tone and creepy background music. The visual details are spot on and perfectly reflect the game theme. This is a high variance slot game which is not for the faint hearted and players on a low budget. Still if you have the courage to pursue the bonus round you can be rewarded with payouts of up to 3.600 x stake, which certainly justifies the high variance of the game. 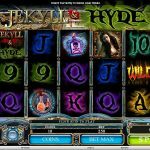 The Wild symbol in Jekyll & Hyde is the Wild Logo and it can land on all of the reels, replacing all of the game symbols except the scatter. The scatter symbol offers a payout of up to 1.250 coins if 5 of them land on the reels, but more importantly triggers the free spins bonus. Once three or more of them show up on the screen you are rewarded with 10 free spins. During the free spins bonus in the game all of the Dr. Jekyll symbols will be transformed to Mr. Hyde symbols. 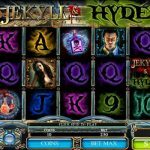 Mr. Hyde has a maximum payout of 7.500 coins or 300 x stake for 5 of a kind wins. You can easily see the payout potential of the slot, considering that with the wild symbol in play this maximum payout value can increase even more. The bonus round can be re-triggered with another set of 3 or more scatters on the reels. 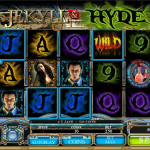 Jekyll & Hyde is a great Microgaming slot which has a very popular theme. The designers did a great job with this game, especially with the bonus feature. All you need to do is go up against the slot and try your luck. If you’re a fan of action movies then you should consider playing Hitman a 5 reel slot by MicroGaming.